The Gauntlet - HAIL SATAN? Th movie: "Hail Satan" is the latest in mainstream media recognition for the Satanic Temple. In addition to being a very entertaining movie, the film also illustrates the very accessible and just doctrine of The Satanic Temple. Many will be surprised how humanitarian, and well quite frankly, altruistic it is. Recognize that it is not a deliberate reverse doctrine to disarm its antagonists. Quite the contrary, the espousal of willful living, independent thought, regardless of superstitious opposition along with its immense strength to not blindly follow social models that may not be good for liberty, is the most accurate doctrine they could possibly espouse. They have boldly gone straight to the heart of Satanism. Many different sects of the Satanic churches at large, have struggled to develop the purest unencumbered spiritual center. TST has striped out any nonsense. At the core is the the realization that evil as a force does not exist separate from human action. Granted the aesthetic is still a part of the movement. But as we know from ergs of research many people feel genuine joy from dark art. Now with a documentary "Hail Satan" in theatres later this spring, TST will no doubt experience exponential growth due in part to its simple accessibility and non-theistic belief - essentially there is no Devil. The Christian Mythology combined with mountains of dogmatism and a very big sprinkle of coloration, make it very much an aggrandized and contrived man-made design for fear mongering and control. The Satan legend illustrates the first entity in endless backward history to disagree with anything and to challenge authority and convention. This brings contrast to the godhead. Contrast is essentially the only thing that makes it possible to derive any meaning from any phenomenon. For without contrast there could be no recognition of feeling and will. In fact without contrast no one rational being could be anything but an indifferent law maker, largely not concerned with pain or pleasure. Satan the archetype really represents the very first free thinker in the cosmos, questioning the alleged ultimate authority as he seeks a more fair method for doing things. Despite all the maiming and killing at the hands of nearly all religions,TST does not budge on its recognition of any other religions right to practice it in their own way, while the Christians in many cases metaphorically cast stones on humans who have been judged to be unfit. TST demonstrations are met with extreme opposition from, in the case of the USA, the Christians who actually look like the bad guys next to the Satanists. This part of TST's mission is by its very objective the only guiding and overriding purpose that makes any sense, and may be the most appropriate and authentic doctrine of most churches, in the world today. With the rise in popularity and attention and the forthcoming film, TST is poised to reach giant populations of members. This is very good news for those who want to maintain at least a shadow of the liberties or rights granted citizens of the United States. TST are doing that to which most rational and honorable people are afraid. This is partially due to the metaphorical slumber into which the bourgeois have drifted. these people have taken the mantle of opposition which, quite frankly is dangerous and terrifying. TST's movement is using such a charged and reviled concept by the very dangerous superstitious opposition - that there could be assassinations and immediate pardons to which no one would raise an eye. Don't think for a second that thoughts and discussions of this nature have not taken place. If you believe in liberty and the most improbable dream of the framers, whether you join the Temple or not, you should be rooting for them, because at this point they just may be our last hope. At the very least check out this Movie at which critics have gushed with positive statements. 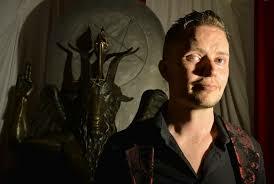 Lucien Greaves, A polymath, graduate from Harvard and among many other things expert on some of the most arcane and obscure lore, is the high priest and founder of The Satanic Temple as well as charismatic leader of the members - As mentioned above.